Hanahaki comes from two Japanese words: hana, which means flower, and hakimasu, which means to throw up. It is a fictitious disease in which the victim coughs up flower petals when suffering from unrequited love. The most common version is when the victim’s lungs fill with flowers and roots grow in the respiratory system. 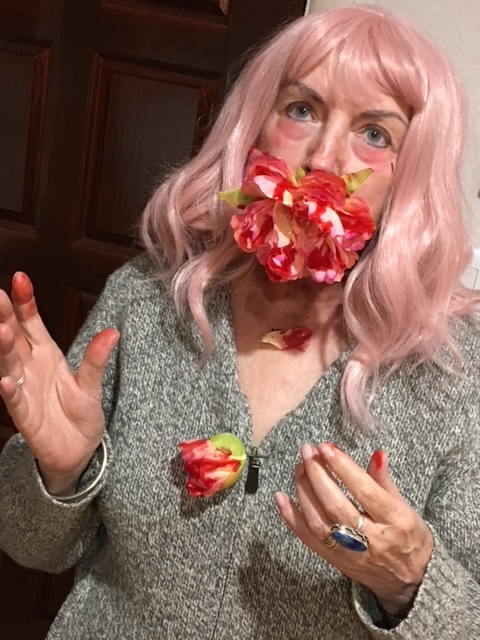 The victim chokes on blood and petals and dies. In another version, the flowers are surgically removed. The surgery also removes the victim’s feelings of love and s/he can no longer love the person they once loved. Sometimes this also removes the ability to ever love again. 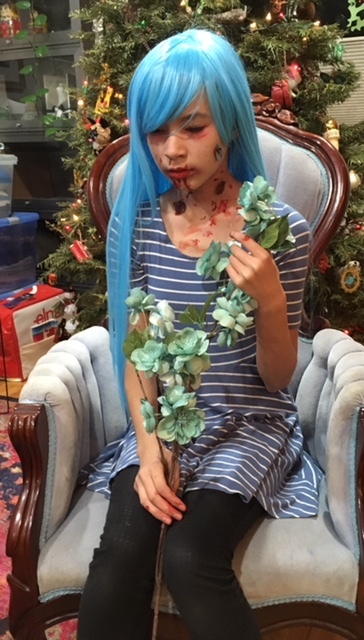 My 13-year-old granddaughter came across hanahaki disease while researching possible diseases for a book she and her friends are writing. Need I say the book is fantasy fiction? 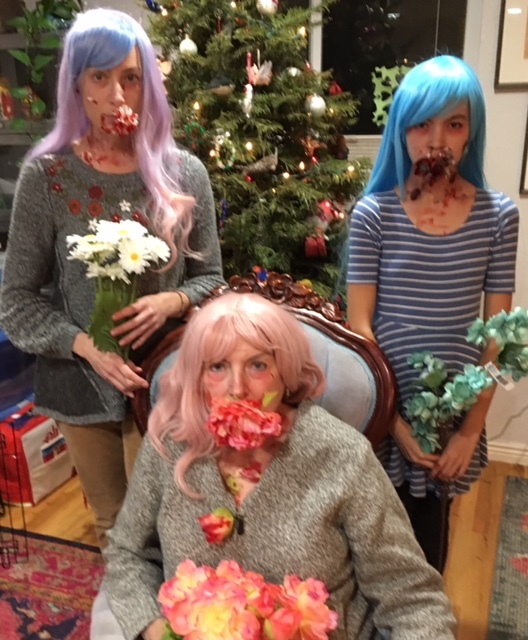 She also enjoys special effects makeup, and one evening created three generations suffering from hanahaki disease—me, her mother, and herself. In researching hanahaki disease, I discovered a whole world of disease and disaster that I was previously unaware of. 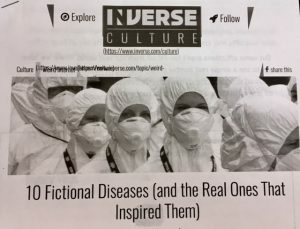 Wikipedia has 40 pages of fictional diseases in literature, film, TV, video games, and role-playing games, everything from the Andromeda Strain to Cooties. 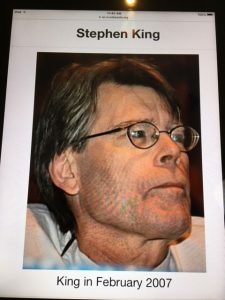 Fictional diseases is probably not the first association you have for Stephen King, but he has created his share, including the superflu in The Stand, the Ripley in Dreamcatcher, and the pulse in Cell. 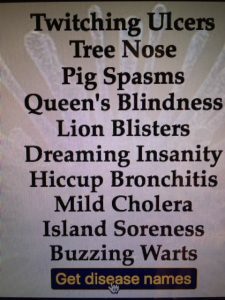 Authors from Edgar Allan Poe to J.K. Rowling have invented fictional diseases. Why not you? Getting started is easy. 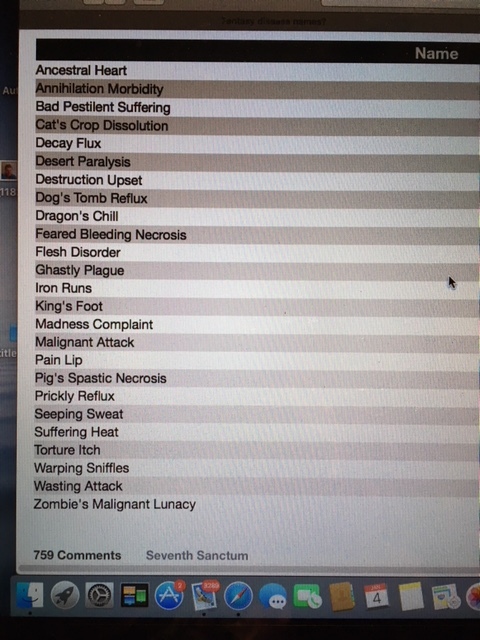 If nothing comes to mind immediately, go to seventhsanctum.com and use the Disease Generator. 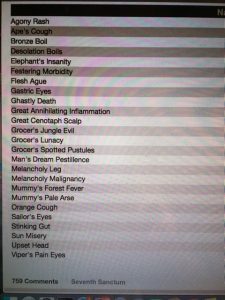 You can get 25 disease names in an instant. And if nothing appeals to you—not ancestral heart or zombie’s malignant lunacy, not seeping sweat or torture itch—just push the button for more diseases. 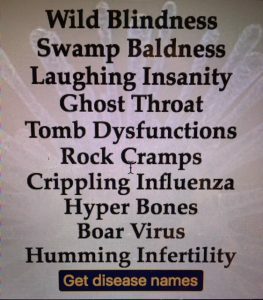 Once you have a name, you need to develop the disease, starting with disease type (childhood/common/rare) and moving on to cause (bacteria, virus, parasite, fungus, imbalance of bodily humors, etc.). You need to consider transmission (airborne, body fluids, food or water, touch, etc.) and virulence (how likely a person is to catch the disease after coming into contact with it). How long is the incubation period? 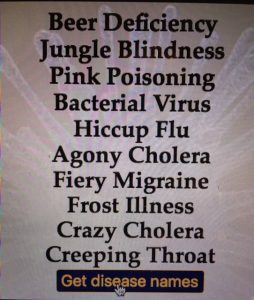 A person could be showing symptoms and become infectious almost instantaneously or it could take years. What are the symptoms of this disease? Is it treatable and/or curable? And last but not least, how do people react when they encounter someone with this disease? 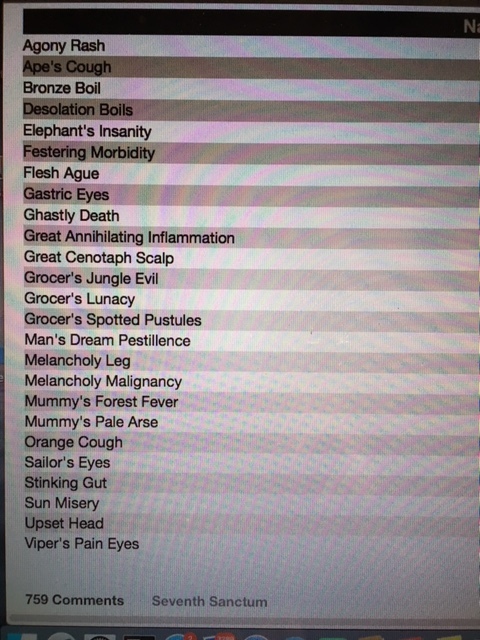 Feel free to use symptoms from real diseases, past or present. For example, cholera, dysentery, small pox, consumption, syphilis, the Black Plague, etc. BTW, the Black Plague is a zoonotic disease, meaning it moves from animals to humans—as in bird flue or swine flu. 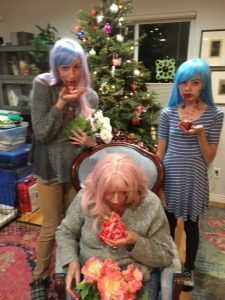 The more realistic your story line, the more realistic your disease should be. 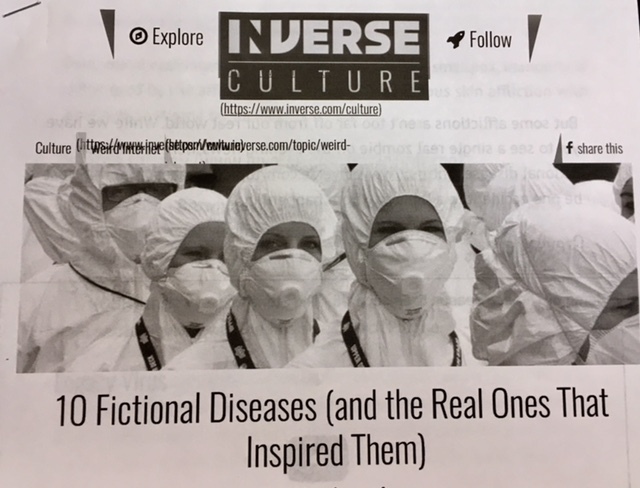 For inspiration, check out Inverse Culture. Bottom line: Consider the advantages of deadly diseases. As long as people fear death, they will push protagonists to the edge, and that’s a good thing.